You know how some of us promised to get fit in January? Well, if you're anything like me, you've edited that notion to "I'm going to get fit for summer." The trouble is that the wellness industry is big business, and a lot of the products out there—from supplements and shakes to sleek kits and classes—promise the world while coming with a hefty price tag. So while a lot of us want to tone up for the holiday season, it can be a pricey endeavour. The question is: Is it possible to be frugal and fit? Well, we come bearing good news: You can get healthy on a budget. You can exercise like Insta-fitties and drink vitamin-rich smoothies without giving your bank manager heart palpitations. Keep scrolling to find out how to hack the wellness system. Seek and you shall find, and that's very true when it comes to free exercise classes. Most fitness brands offer free workouts or run clubs in and around their stores. Sweaty Betty offers yoga, Pilates, barre, HIIT and more. Nike has running clubs all across the capital, while Lululemon has yoga and running classes happening in its stores across the country. There is also the nationwide Park Run, where you head to your local park on a Saturday to do a timed 5k run. There is usually a good community feel, and getting your time means you can try to beat yourself each week (if you wish). If you have the willpower to work out alone at home, rather than sending the time vegged out on the sofa in front of a binge-worthy Netflix show, then YouTube has a wealth of free workouts. Forget paying over the odds for tiny punnets of fruit. Instead, make your way to the freezer section to stock up on frozen fruits and vegetables. Frozen food may have got a bad rep, thanks to their association with unhealthier options, but fruits and vegetables will have started out fresh and been frozen as close to being picked as possible to retain the nutrients. With any frozen foods, you need to eat them within the recommended time frame to ensure the best nutritional quality, but frozen fruits and vegetables will last longer than fresh. Plus, they're generally a lot cheaper. Most supermarkets also sell bags of frozen smoothie mix, while some even sell frozen avocados. If you're interested in the process involved in frozen foods, check out this BBC documentary. The high-street activewear offering is pretty stellar right now. Gap, H&M and River Island all offer pieces that don't just look good but function too. Alice Liveing has collaborated with Primark on an affordable activewear collection, and ASOS is always worth a look, as its activewear section is constantly evolving. Want a discounted branded kit? If, when it comes to your gym wardrobe, you don't care whether a certain colourway is "in season" or not, then Sports Direct and TK Maxx are great places to seek out a bargain on all types of kit from clothing to accessories. Nike's classic sports bra is my absolute go-to and it comes in at a very reasonable £22, considering how well it wears. F45 has a seven-day trial for £20 (classes are usually £25 each). 1Rebel has a package called Fresh Meat for first-timers. Three sessions for £30, instead of the usual £20 per session. Sweat by BXR has a First Time Versa pack, which is £30 for three classes instead of £30 for one. Kobox does a First Timer offer that includes two classes and a set of hand wraps for £25. At Psycle, buy the intro offer (£20) and you'll get two classes plus a buddy pass so you can take a friend along to one. Another Space has the same offer as Psycle for £30. At the moment ClassPass has a new year offer of 70% off for the first month, so if you sign up for 10 classes (usually £105 per month), it will be just £31 (that's £3.10 per class!). Sometimes going to the gym just isn't what you fancy, so why not download an app to give you a helping hand? Nike has a great free app called Nike Training Club, which has tons of great exercise classes to try. Or what about the majorly hyped Kayla Itsines Sweat with Kayla app? It's £10 a month but packed full of intense HIIT workouts with little to no equipment needed. 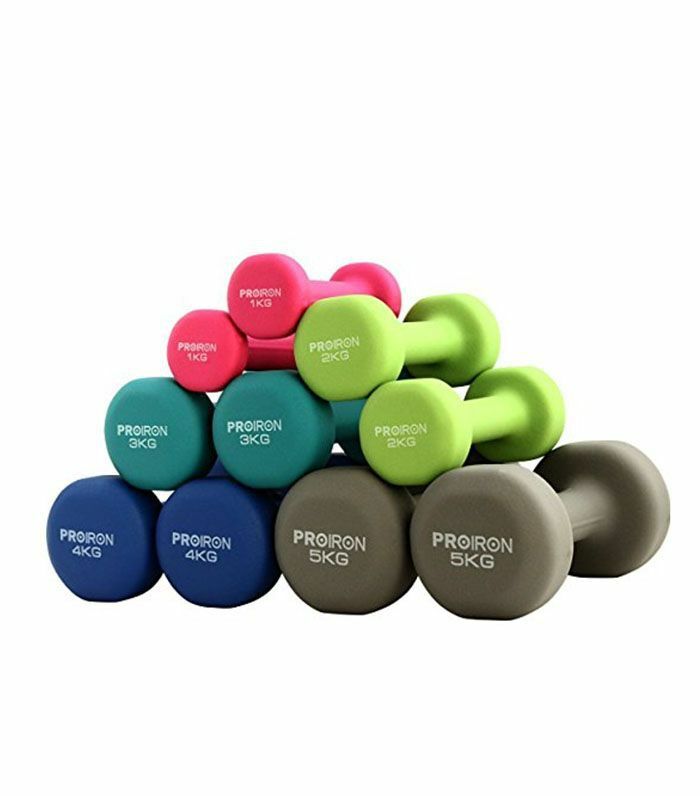 Invest in some weights off Amazon and you're pretty much good to go. We know what you're thinking—either a) I do this anyway, or b) this won't make me fitter. Chances are, though, you're not walking enough, and walking everywhere will do exactly that. Walking can help you maintain a healthy weight, prevent things like high blood pressure and heart disease and it can help you maintain a healthy weight. (Literally, all you have to do is put one foot in front of the other, no running required.) Set yourself a target of walking home from work one day a week—if it's within walking distance, that is—or going for an hour-long walk on the weekend. There you go—now you can get fit on the cheap.